El Pentágono is a compilation album by the reggaeton producer and owner of Update Music, Revol, although the album was presented by Don Omar and released on March 27, 2007. 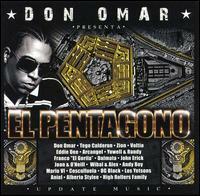 ^ "American album certifications – Don Omar – El Pengagono". Recording Industry Association of America. If necessary, click Advanced, then click Format, then select Album, then click Type, then select Latin, then click SEARCH.